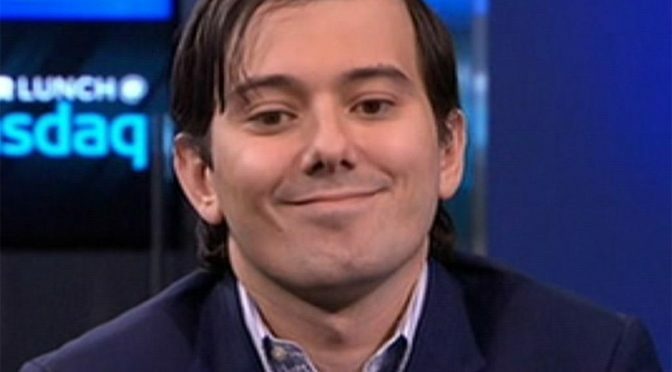 When Martin Shkreli’s company, Turing Pharma, purchased the rights to a drug, Daraprim, and hiked the price from $13.50 to $750 per pill, my first response was outrage, along with the rest of the internet. Unlike most of the internet, I also felt a distinctive jolt of fear. I am part of the small population of people who rely on Daraprim. Many articles describe Daraprim as a drug used to treat AIDS, but that’s not quite accurate. Daraprim treats toxoplasmosis. About a quarter of Americans are infected with toxoplasmosis, but for most, it’s not anything serious. Some people feel some minor flu-like symptoms for a few weeks, if they feel anything at all. For pregnant mothers and people who are immunocompromised however, toxoplasmosis is something much, much worse. Without the benefit of a healthy, developed immune system, toxoplasmosis causes ocular and neurological damage. Most of the people at serious risk are AIDS patients. These folks face severe illness, dementia and blindness. A smaller percentage of those at risk are people like me, who contracted toxoplasmosis before we were born. We deal with a range of issues, including but not limited to: Blindness, epilepsy and developmental/intellectual disabilities. A delay in treatment for people who need it means toxoplasmosis has more time to do its damage to the eyes and brain. I felt my stomach drop as I read doctors weigh in on Daraprim. The drug is now too expensive for some hospitals to stock, and for others the drug is already almost totally unavailable. Dr. Rima McLeod, a major toxoplasmosis researcher, says she’s been able to access Daraprim by asking Turing Pharma directly, but one shouldn’t have to know an influential medical professional to access such an important drug. And even if someone does know the right people, the delay is still there. My knee-jerk response to all of this was to see Martin Shkreli as the kind of supervillain you’d see on an episode of Captain Planet. My initial tweets were not kind, and I lashed out with everyone else. Daraprim saved what’s left of my eyesight. The side effects can be pretty brutal, but in relation to what they treat, they’re not too bad. No one else who’s taken the drug seemed to be involved in the conversation, so I thought I’d weigh in and contact Martin Shkreli. To my surprise, Shkreli tweeted back. When confronted about hospital shortages, Shkreli’s response has been to personally distribute affordable or free drugs to low-income patients when medical institutions and researchers ask for them. The problem, which he doesn’t recognize, is that he’s created a structural problem in the supply chain. 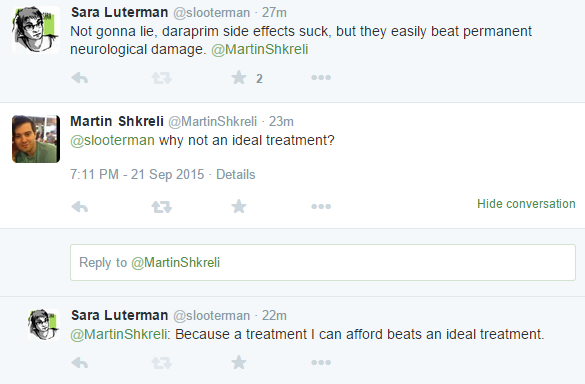 The vast majority of people who take Daraprim are economically disadvantaged. People should not have to rely on someone’s benevolence and charity to get necessary medical treatment. The problem with Martin Shkreli is not that he is Snidely Whiplash, gleefully tying sick people to railroad tracks. The problem is that he lives in Libertarian La La Land, where profit is thought to be the best way to enact positive change. Shkreli honestly thinks he’s doing the right thing, and that increasing the amount of money for toxoplasmosis treatment R&D while making a tidy sum for himself is good for the world. No one needs the R&D and both doctors and patients are pretty satisfied with an existing treatment that they can actually get, but that’s irrelevant to him. He’s on a mission to fix the world. This naïve worldview is unfortunately common among the affluent startup set. When Shkreli says he doesn’t understand why people are getting upset, he’s being sincere. 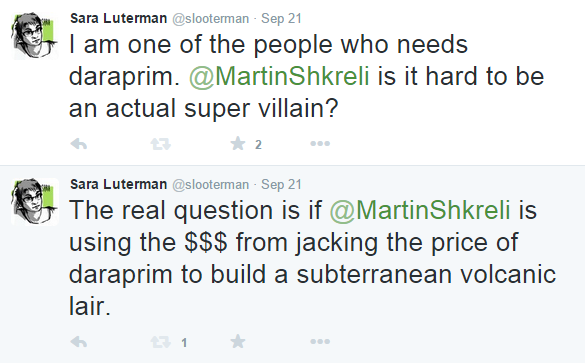 I’d feel sorry for him if I wasn’t worried about myself and the other people who rely on Daraprim. What can be done? Everyone from Hillary Clinton to the Pope has called out the system that allows pharmaceutical companies to control rates with little consideration for the needs of patients. In the face of overwhelming pressure, Shkreli has relented and says he will lower the cost of Daraprim, but he has not said by how much. The legal loopholes Shkreli’s startup used to acquire Daraprim and other drugs for the sole purpose of raising their costs need to be closed. It should be easier for competing companies to get approved for and produce Daraprim so the “free market” Shkreli and his cohort are so in love with can actually do its work. Some politicians have even raised the possibility of price controls. As we head into the election season, pay close attention to what candidates say when they are confronted with the case of Turing Pharma and similar businesses. If you see something that looks fishy, write about it. Tweet about it. Tell everyone you know. Daraprim isn’t the only drug that pharmaceutical execs have increased the price for astronomically. The only reason Shkreli’s company changed its position is overwhelming pressure from the public. Our voices count. I was interested in the original version of NOS magazine and now discovered this site. This sounds worrying. 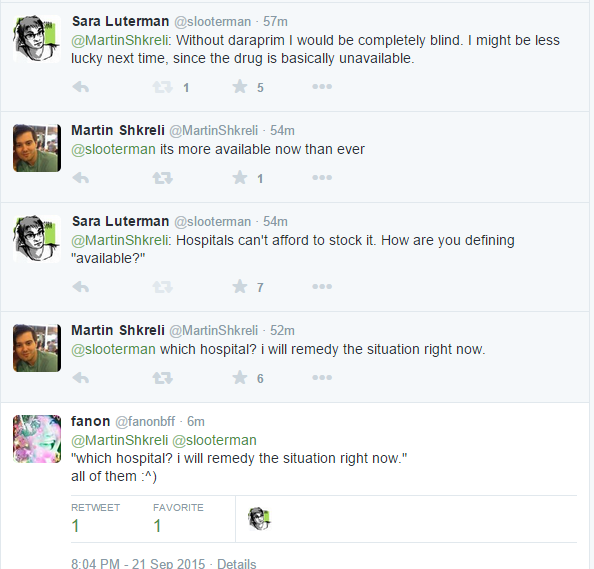 Are you going to be able to get enough Daraprim in the meantime? Hi Yuval! Thank you for your concern. Fortunately, Daraprim is not something people generally take on a daily basis. I’d only need to take it in specific circumstances. The problem is that those circumstances are pretty serious. Autism Speaks: How Long Does It Take to Look into It? NOS Magazine is a news and commentary source for thought and analysis about neurodiversity culture and representation.